Saint Vincent is now hiring part time PRN Youth Development Specialist for weekends 2-10pm for $12-$14 hourly. Employee requirements are: 1) Bachelor’s Degree in Social Services; 2) Must be 21 years of age; 3) valid drivers license; 4) experience working with social and emotional development of youth. There is a $100 signing bonus after 60 days of successful employment. 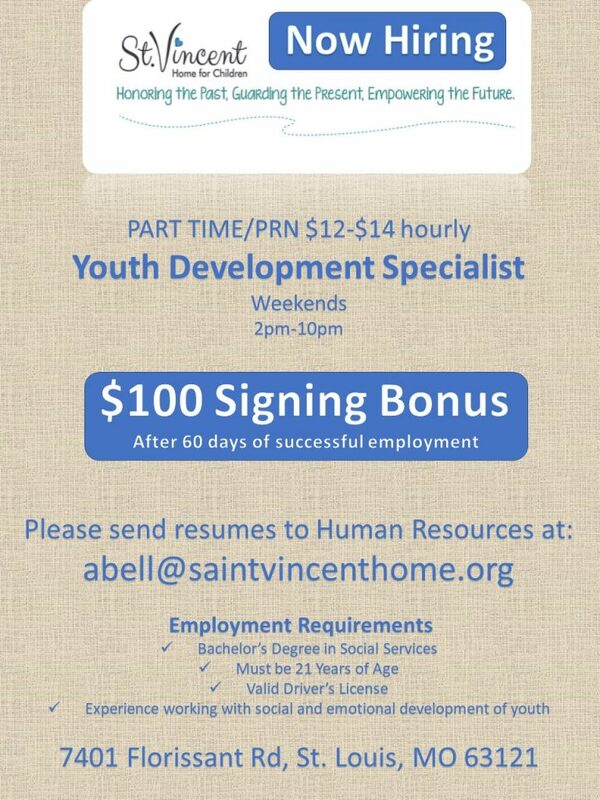 Please send resumes to Human Resources at abell@saintvincenthome.org. PLEASE JOIN US! You are Cordially Invited to Attend St. Vincent Home for Children’s Unveiling and Grand Opening of the Youth Development Center. Come meet our team, learn about our new Youth Development programming, and enjoy light refreshments!